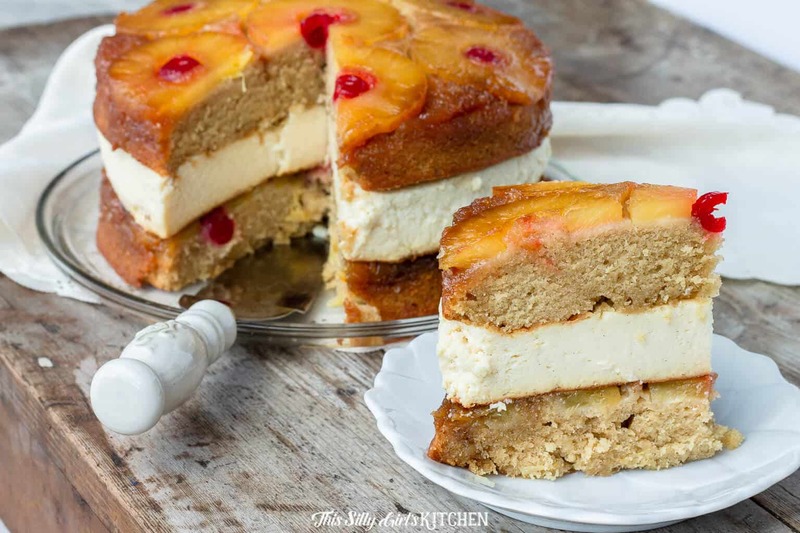 Pineapple Upside Down Cheesecake, two layers of buttery pineapple upside-down cake stuffed with pineapple cheesecake, just like The Cheesecake Factory… but homemade! 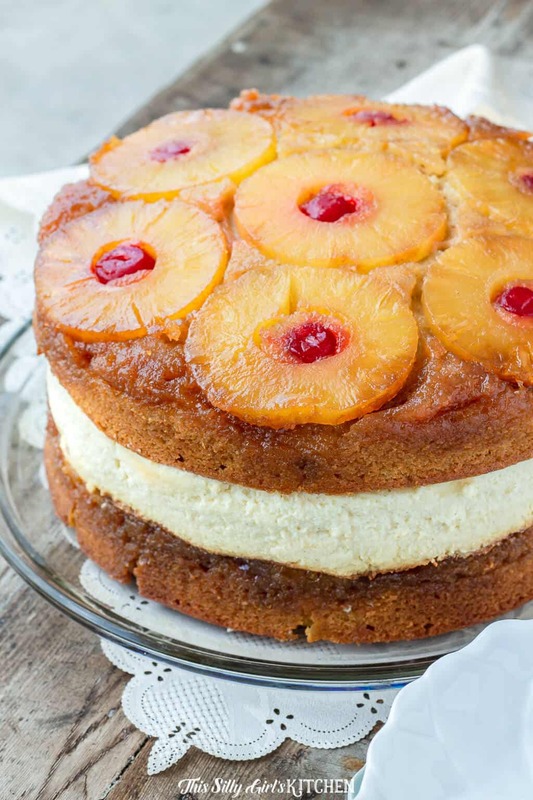 Who knew your two favorite desserts could get any better, pineapple upside down cheesecake for the win. …. but yesterday it was my birthday so it has been all about what I likes. So, I wanted a massive dessert for my birthday… is that a crime?! My favorite cheesecake from The Cheesecake Factory of all time is their Pineapple Upside-Down Cheesecake. 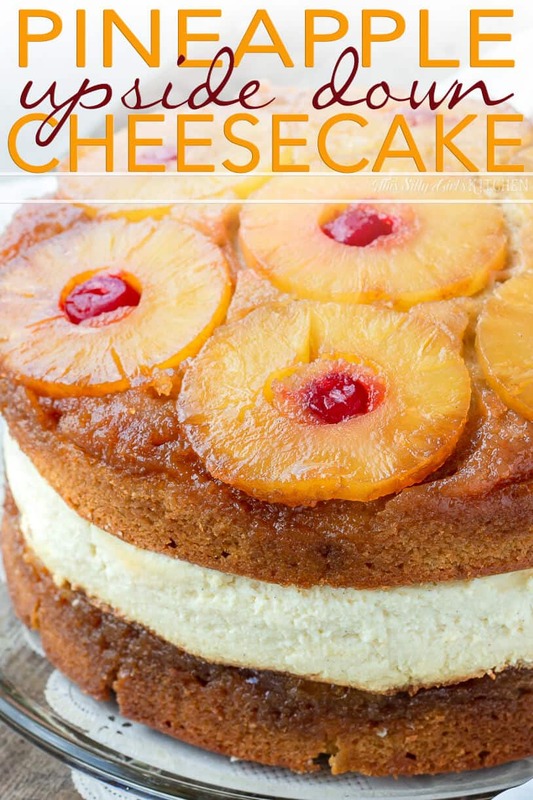 It’s a lightly flavored pineapple cheesecake layered between two buttery pineapple upside-down cakes. So, for my epic birthday cake this year, I made this bad baby! It’s everything I hoped for! And then some. Cheesecake Factory cheesecakes are big… but this… this thing is ginormous! 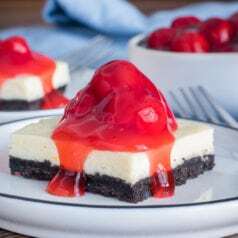 This recipe, like my last cheesecake cake Strawberry Shortcake Cheesecake, takes a little planning ahead. 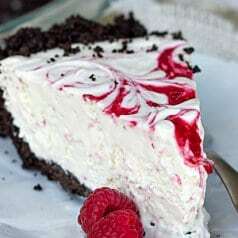 I suggest making the cheesecake the day ahead and letting it get nice and cold in the fridge overnight. 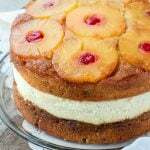 BUT, the pineapple upside-down cakes should be made the day of for a nice presentation. You can still eat it for days and days after but that first day it will look the best. I have to be honest, I always get nervous after typing up a recipe like this. It looks like it’s totally complicated and will take forever but in reality, it’s not that bad. 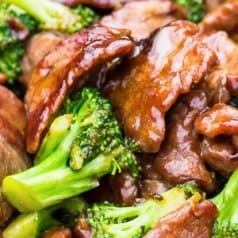 Sure, this recipe probably isn’t for a complete beginner but just break it down into steps. Just look at the cheesecake recipe, then the topping, then the batter. See, not that bad. I’m also being sensible with the portion sizes, believe me, a small slice of this goes a long way!! Yummm, excuse me while I wipe the drool off my keyboard. This is one heck of a cake!! I truly hope you liked today’s recipe! What is your favorite Cheesecake Factory cheesecake flavor?? Preheat oven to 350 degrees. Grease a 9-inch springform pan. Cream the cream cheese with the sugar until smooth in a large bowl. Mix in the milk fully then add in one egg at a time and mix. Add in the remaining ingredients and mix until smooth with no lumps. Pour into the pan and bake for 1 hour, the center will be slightly jiggly. Shut off oven and let cool down in the oven for 5 hours. Top with plastic wrap and place in fridge overnight to get cold. 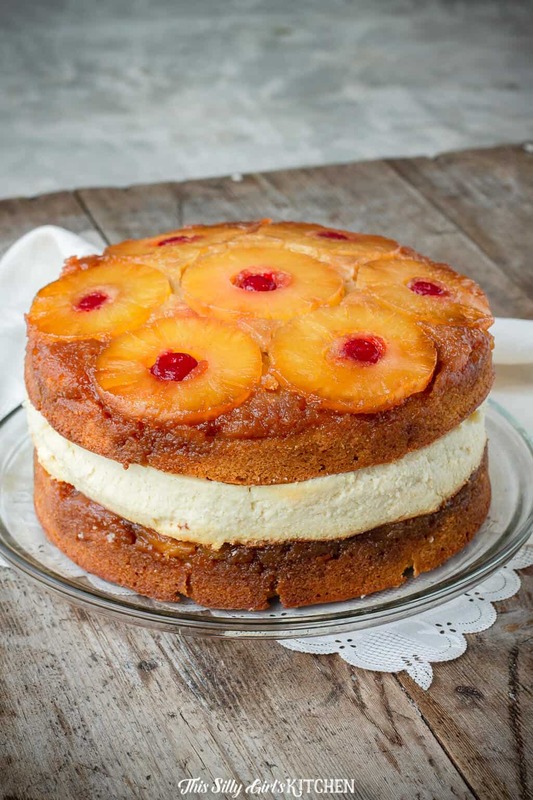 Start with the topping by dividing the melted butter equally between two 9 inch cake pans. Sprinkle 1/2 Cup of the brown sugar into each pan. Arrange the pineapple slices and cherries as pictured, set aside. Preparing and cooking the cake: Preheat oven to 350 degrees. In a large bowl, add in the sifted flour, baking powder, baking soda, and salt, whisk to combine. In a medium-sized bowl, add in the 1 Cup melted butter, brown sugar, and granulated sugar. Whisk to combine, getting all the brown sugar lumps broken up. Whisk in the eggs, sour cream, milk, pineapple juice and vanilla until combined. Add the wet mixture to the dry mixtures and mix until combined, with no dry spots or lumps. Evenly divide the batter between the two pans, about 2/3 of the way full, do not overfill! Line oven with foil or two cookie sheets, cakes may bubble over some. Bake for 48-53 minutes, covering loosely with foil at the 20-minute mark to avoid burning. Cakes are down when a toothpick inserted in the middle comes out clean. Place cakes on a wired rack to cool for 10 minutes. Invert cakes, one onto a flat surface like a cutting board and the other on the plate you will be presenting on. 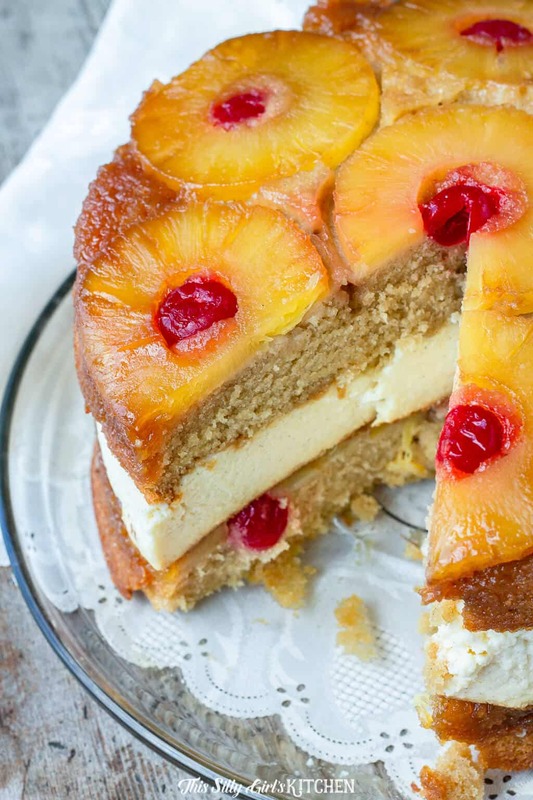 Take out the pineapple cheesecake. Trim top of the cheesecake if it is not even. Take it out of the pan and lift it off the bottom carefully, you may need to use a tool like a frosting spatula to help. Place on top of the first cake layer. Trim the sides of the cheesecake with a knife if necessary. Place the second layer of cake on top. Serve as is or with whipped cream, enjoy!! Errrrr… that definitely shouldn’t happen. The cheesecake layer isn’t that thick. Did you somehow double the recipe on accident?! I honestly don’t know why there would be an issue. 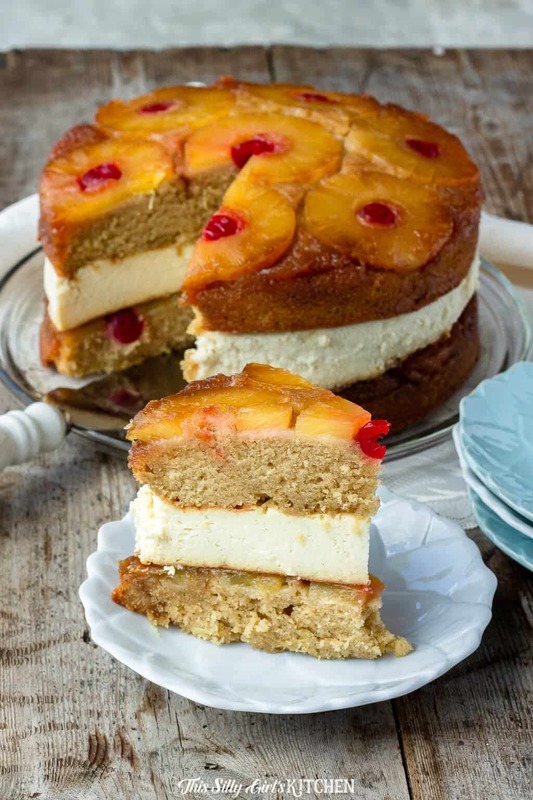 Did you happen to add the cheesecake batter on top of one of the pineapple cake batters and baked it that way? Everything should be baked separately.